Organizations are beginning to realize that improved effectiveness and efficiency of finance and accounting processes are not only worthy goals within the finance department, but goals that have strategic benefits for the corporation as a whole. Chief financial officers must ask themselves –Are our financial processes world class or second class, and how does this impact our overall business process transformation initiatives? There is a great deal of variation in financial process effectiveness and efficiency across companies. This variation puts some companies with second class processes at a distinct competitive disadvantage. A great deal of the performance variation is due to manual processing of documents. Until recently, technology to streamline accounting processes was beyond the reach of many organizations; however, this is no longer the case. 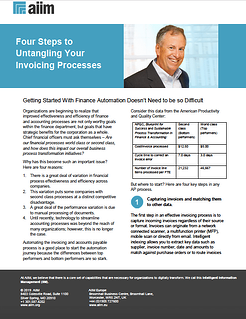 Automating the invoicing and accounts payable process is a good place to begin. If you're ready to get started, download this FREE tip sheet and get on the path to financial process automation today.